Do you want to travel the country, meet new people, create lifelong friendships, and give back to your community? 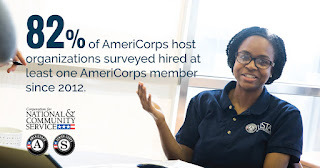 If the answer is yes, AmeriCorps is a way you can dedicate your time and skills to serve. 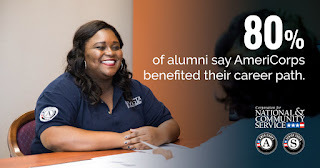 According to AmeriCorps Youth Outreach Specialist for the NorthEast Region, Jessica Brown, each year more than 80,000 American’s enroll in AmeriCorps between the ages of 18-24. With more than one million alumni, AmeriCorps has provided life-changing experiences for members to jumpstart their career path. As a member of AmeriCorps, you can travel the country, earn money for school, and meet the critical needs in your community in 10 to 12 months! The advantages of becoming a member allow you to receive money for college, student loan repayment assistance, living allowances, health benefits, and potential job opportunities. At AmeriCorps, you can gain professional skills, network, and begin living your dreams with no prior experience necessary! If you’re ready to begin creating your future and want to find out more information, please visit www.corps.vet.